Supreme Court held that the Courts have no discretion to reduce the fine prescribed in Sec 85 (a) (i) (b) of the Employees’ State Insurance Corporation Act, once the offence has been established. Apex Court Bench comprising of Justices Dipak Misra and Shiva Kirti Singh held that discretion as per proviso to Section 85 (a) (i) (b) is confined only in respect of term of imprisonment. A Division Bench of the Supreme Court on Friday reportedly dismissed a Public Interest Litigation demanding the change of the country’s name from India to Bharat. CJI Thakur opined that the decision to call the country Bharat or India should be left to the citizens of the country. SC questions Govt on Govt Ads. 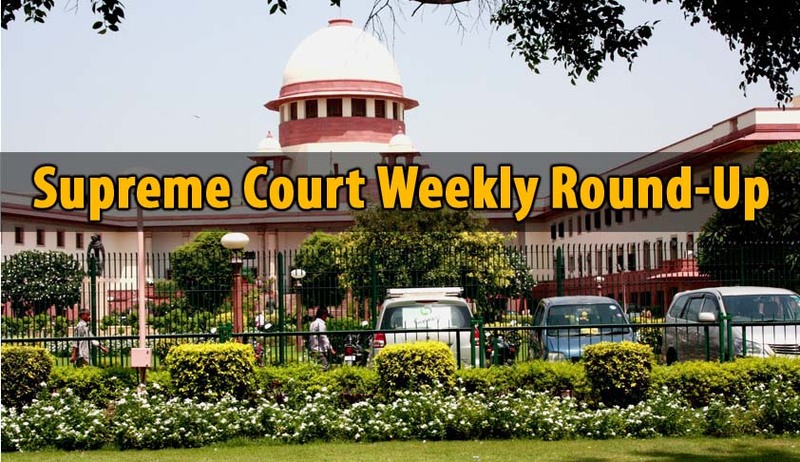 During the hearing of the review petition in the open court on Wednesday, the Supreme Court bench heard the Attorney General, MukulRohatgi opposing the judgment laying down the guidelines in the Government advertisements case, and reserved its decision. Supreme Court clarified that subsidies allowed to assessee, has to be included under the head “profits and gains of business or profession”, and not under the head “income from other sources” for the purpose of Income Tax assessment. A Division Bench of the Supreme Court on Wednesday reportedly dismissed a batch of petitions demanding review of its decision approving Kerala’s new liquor policy that bans drinking of liquor in public and limiting serving of alcohol to five-star hotels. Supreme Court, observing that there is no constitutional duty for the state to make reservation for SC/ST in matters of promotion, refused to direct the Government to collect and gather the necessary data for the purpose of taking a decision as regards the promotion and consequential fixation of seniority. The Supreme Court of India on Friday, dismissed a petition which sought quashing of criminal cases against Gujarat policemen in the alleged encounter killing of IshratJahan, who according to the plea was a “terrorist as deposed by David Headley” who plotted to kill the then Gujarat chief minister Narendra Modi. The Supreme Court directed all states to sterilize and vaccinate stray dogs under supervision of Animal Welfare Board of India using provisions of the Prevention of Cruelty to Animals Act for controlling its population and rabies. A bench headed by Justice Dipak Misra however remained silent on the question of culling of nuisance-causing dogs. In an ongoing case, Vishanta& Others v Union of India the Supreme Court bench comprising Justices Madan B Lokur and NV Ramana, on 9 March, expressed its distress that Haryana has not fully constituted the Child Welfare Committee, as directed by it. A Three Judge Bench of the Supreme Court of India referred the question ‘whether a legislator facing criminal trial should be disqualified at the very stage of framing of charges against him by the trial court? ‘to the consideration of Constitution Bench. The Supreme Court observed that Counter claim can be filed even after framing of issues, if the recording of evidence is not concluded. Apex Court Bench comprising of Justices Jagdish Singh Khehar and C.Nagappan made this observation in Vijay Prakash Jarath vs. Tej Prakash Jarath. The Supreme Court on Tuesday, issued notice to the Health Ministry on a PIL which sought immediate implementation of plain packaging rules for cigarette and other tobacco products saying jazzy covers and those with messages only attracted more consumers. A Division Bench of the Supreme Court on Thursday, accepted the interim report filed by retired judge, Justice P.V. Reddy, laying to rest the uncertainty that had surrounded the Delhi Judicial Service Exam, 2014 for a long time now.